Reached here this A.M. and went right to work. We are almost settled now, in the new barracks. Please send me some Bath Towels and some face towels – old ones preferably and when you send my laundry – don’t send any pajamas. Lawrence took this photo of a barracks building at Fort Sheridan. Received the towels, etc. this afternoon. Thank you for sending them so promptly. Thanks also for the papers and the chocolate. Everything is fine here. So far it has been more like a vacation – not that we don’t have to work and work hard all the time, but it is such a change that I can’t realize until I think back just how much work we have done. There are several things I would like to have you send me when you have the chance, among them are my shaving mirror which I think is in my old Culver trunk, my best canvas puttees, which were on the shelf in my closet, my two suits of pajamas, my tennis slippers, bathing suit and supporter from Fox Lake and my ’09 Culver jersey. If you can find my blue celluoid soap box send that along. I intend to send all my civilian clothes home in a few days. I think you will find in my drawing box (on my closet shelf) a bicycle oil can, which please inclose also one of those samples of Marble’s gun oil of which we had so many last year. Will write a regular letter Sunday. 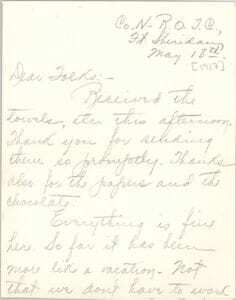 The front of Mortimer’s May 18 letter to his parents. Please don’t send any cookies, etc as I intend to stick to straight Army rations for a while at least. I don’t know how long a letter this will be because it isn’t any too warm around camp this morning. It was very hot all day yesterday and last evening it rained and turned cold. This morning it is decidedly chilly. When I reached here Tuesday morning the first thing I had to do was register and be assigned to a company. After registering everybody went to the Hospital for the first inoculation of Typhoid Prophylaxis. Then we reported at Company headquarters where we were given barracks assignment and issued a cot, a mattress, a mattress cover, two blankets, a pillow and a pillow slip. We are to receive four sheets and another pillow case to-morrow. 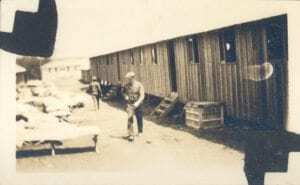 After setting up our cots in the barracks we reported at the office, were issued five text books and went to the mess hall for a conference on a lesson assigned in one. Since then we have followed a regular schedule which I will give you later. The first eleven companies of the Wisconsin-Michigan regiment are quartered in the old stone in the post, the other four companies, (M, N, O, & P.), also the entire Illinois regiment, are quartered across the ravine in the new pine barracks. We are very comfortable. On one side of the regimental street is the mess hall with the kitchen in the rear. Now that they have installed modern ranges they no longer use the field kitchens described in the Tribune. Each mess hall has two long tables with stationary benches like a picnic table. Across the street from the mess hall is the first barracks. The front of this is the company commander’s office. The barracks proper starts back of that. Back of this building is the second barracks. Each of these buildings holds 75 to 80 men. Companies have been reduced to 150 to 155 men. Back of the second barracks is the lavatory with showers and everything complete. 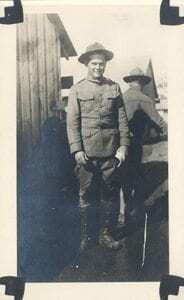 Our Company Commander is 1st Lt. Morrow of the Field Artillery and he certainly is a dandy. He is strict without being unreasonable and I sure hope that when we are split up into Field Artillery etc that I draw Morrow for a C.C. We have a mighty fine bunch of fellows in Co N, all very congenial and anxious to learn. Emil Prellwitz is in N – but no one else from Beaver Dam. Jack Millspaugh of Milwaukee was my next door neighbor for a few days but was transferred to Co. E.
Reveille at 5:15 A.M. – assembly at 5:30. After assembly we police the Company Street and the barracks. Mess is at 6:20. At 6:55 is First Call for Drill with assembly at 7:00 From then till noon we have drills of various kinds such as Physical, Signalling, Rifle Sighting and generally a conference of an hour or hour and a half on the text books or on proper use of our equipment. Noon mess is at 12:00 and from then till 1:00 we have nothing to do. From 1:00 till 3:00 we have more miscellaneous drill and some Company drill and from 3:00 to 4:00 and most of the time a little after we take hikes across country. After drill we are allowed to loaf till mess at 5:30 and after mess until 7:15 when we are called to quarters for study from 7:30 to 9:30. Taps is at 10:00. We have five textbooks – Infantry Drill Regulations, Manual Interior Guard Duty, Signal Book, Field Service Regulations and U.S. Army Regulations. And they are not a bit particular about how long lessons they assign. Saturday we have inspection in the morning and other odd drills but are free for the afternoon. There is always plenty to do. Sunday we don’t have Reveille till 6:30, mess at 7:15. 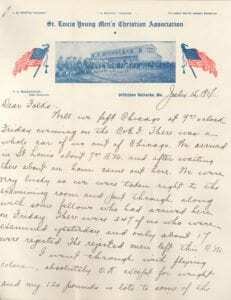 Since I started this letter we have set up a stove in the barracks and are comfortable now. The meals here are good but nothing luxurious. Altogether we are in good shape here. Our rifles and other equipment were issued Friday so now we have everything complete except uniforms. I did not stop in Chicago long enough to get anything so was measured for uniform when I got here. They were expected Saturday but have not come yet. Hope they get here soon, for my clothes are in hard shape. Please send my raincoat when you have a chance. Your letter received also the jersey for which I thank you. The latter comes in especially handy. The papers came also. I passed them on to Emil Prellwitz after I read them. Since Sunday it has done nothing but rain. We have had no outdoor drill at all except an hour’s hike this morning for exercise during a short let up. We stuck to the paved roads and all felt much better when we had finished than when we started. Today we received our second inoculation of Typhoid Prophylactic and everyone seems to be complaining of sore arms. Hope mine won’t get too sore, because I must eat even if I don’t work. Hope Katinka is having better weather in Madison than we are here. She no doubt will enjoy her trip. I suppose you are reading the Fort Sheridan news in the Tribune, every day. Don’t believe too much of it for it is a lot of bunk and written mostly for the effect on the men who are to be drafted to serve under us after we are commissioned. Don’t think from that this training is any joke. Far be it from such. It is work of the hardest kind and everyone who finishes the course ought to receive some recognition from the Government. Some of us may not, but time alone will tell that. Can Will get me ½ dozen pairs of light weight natural color wool sox size 10? I could buy them here but Marshall Field & Co’s store here wants 50¢ per pair and that is too much. It is time for bed now so will close. Lawrence took this photo of a fellow soldier, R.E. 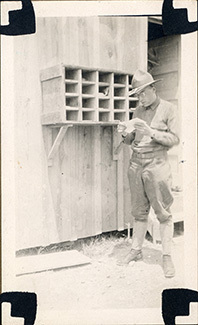 Mauger, reading mail from home while training at Fort Sheridan. Well here we are at the end of another week and it doesn’t seem as though I had been gone three days. Things certainly have been rushing along in fine style. We are getting busier every day, and while we are on the subject I might say that no one hesitates about soaking it to us as far as work is concerned. So far we have had to learn two signal systems and codes, have finished one textbook complete, and have been issued two more, making seven in all and have covered everything in squad and company drill including aiming and sighting drills but no range practice. We have had and completed a course of instruction in bayonet instruction but are going to take it all over again. One of the boys from the famous Canadian “Princess Pat” regiment is in camp and has given the officers pointers on how it is done in France and their method over there is so different that it necessitates our unlearning what we have had and learning the principles all over again. Yesterday we took a practice march with what is called a light pack. Including the gun we carried we were toting about 25 pounds. We were out two hours and as we took it easy we only went about seven miles. It was easy, no trouble at all. This morning at inspection we were out with a full march kit of forty pounds which with the gun made close to fifty pounds. We did some drilling after the inspection and altogether were out and hour and ¾ but I noticed the full pack even less than I did the light pack. This week we have a practice march with the full kit. It ought to be easy after this morning. Our inspection this morning was complete in every way and was really a double one being a company inspection on the parade ground and then a barracks inspection later. Both were on the line of our Culver inspections. As this last week has been rather rainy and muddy our barracks floors were rather in poor condition so yesterday afternoon after drill we all got busy and moved out everything except the stoves and scrubbed the floors. We had a fine looking place when we finished I can tell you. I was orderly in charge of the barracks from yesterday noon till this noon so you can imagine I was rather busy this morning, for besides shaving and cleaning my gun and getting my pack ready I had to see that the whole of the barracks was dolled up. Of course everybody has to clean up around his own bunk so there wasn’t much actual work to be done. This afternoon I went over to Highland Park and did a little sight seeing (?). It is rather a nice little place and I was able to get a few little things I wanted. To-night the Y.M.C.A. had a house-warming at their new building (temporary like our barracks). The band from the U.S. Naval Training Station at Lake Bluff furnished the music and Col. Nicholson, the Camp Commandant spoke. Everybody had a good time for a couple of hours. The weather this week has been rather changeable. Sunday, Monday and Tuesday were cold, rainy and distinctly disagreeable. Wednesday was cold but sunshiny, Thursday warmer and Friday was fine. Tonight it rained again but the sun showed up about seven o’clock so we hope for a good day tomorrow even if today was cold and raw. Well it is getting along toward Taps so I guess I’ll finish this tomorrow. 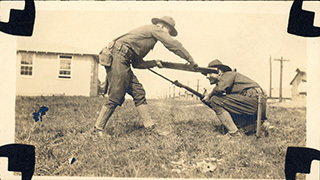 Two of Lawrence’s fellow soldiers, White and Aseltine, demonstrate close quarters combat techniques. Well today is another cold raw disagreeable day and I sure am glad we don’t have any drilling to do. I suppose it is a good thing to have some cold weather now and get us toughened up a bit for I imagine it will be pretty cold when we go over to France next January. We have our third and last typhoid inoculation Tuesday. All will be glad when it is over but then we have small pox and scarlet fever vaccination. Everyone has to take the typhoid inoculation unless they can prove they have had it within the last two years. It is only good for five years. I suppose Paul & Fred are with you today. Wish I could come in for a few hours. How are all of you feeling? Hope you are as well as I am. Am returning the T.P.A. letter which I think is a fine one. Please keep it for me. Jack Millspaugh has been transferred back to Co N. and is in the same barracks. There doesn’t seem to be much else to write just now. Will write again in a few days. The last letter I received was dated May 23rd. Hope you are not sick and that everything is O.K. 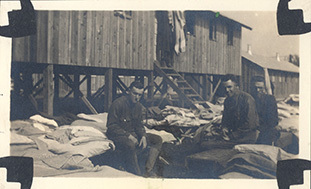 Lawrence and two friends, French and Rieves, in the midst of cleaning their barracks. Received your letter of the 25th yesterday morning, also the papers. Your letter of the 27th came this morning and the sox came this afternoon. Was very glad to get all of them, thank you. The sox are fine and are just what I want. If Will has a half dozen pairs please send them and have him charge them to me. The wool sox are much more comfortable for marching than cotton. I was very much surprised to see the letter in the paper as it was written to Art Volkman and not for publication, still it didn’t sound so very bad. We had our third inoculation today and now have nothing before us except smallpox vaccination. I suppose I will have to take that as I haven’t been vaccinated since 1906 and not successfully since the first one. What year was that vaccination, 1894 or 1893? The second inoculation didn’t make me sick but it made my arm awfully sore for a couple of days. I hope this one won’t be as bad for tomorrow is a holiday. I don’t think I’ll send any laundry home unless it needs mending. A Chicago laundry has an agency right on the grounds and as the prices aren’t very high I am trying them on account of the convenience. Has Will found his housekeeper? I guess that “ad” must have set lots of people to wondering. I am glad the family is getting notorious. We ought to do something for our country newspapers once-in-a-while. How are all of you feeling? I am glad housecleaning is all over so you won’t have that to look forward to. How did the folks find things at Fox Lake? It is too bad the boat house was damaged. 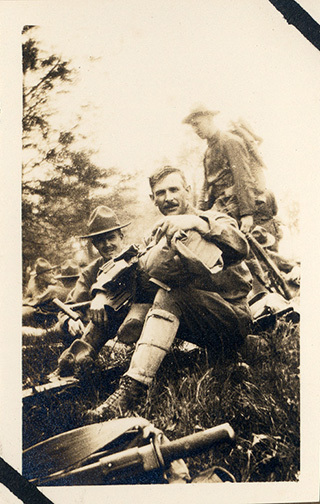 Tell Harold Schemmel he needn’t look for my picture in the Tribune, all they report is news of the Illinois regiment. Have had two promotions lately. Yesterday five of us were picked to act as instructors at signal drill from now on, and I was one of the five. Today I was made leader of a squad at drill which gives me a little more chance to exhibit my proficiency than just being a private. Of course these promotions have no special significance except that the Commander sees that I am working hard and making some progress. Must close now and get to work. 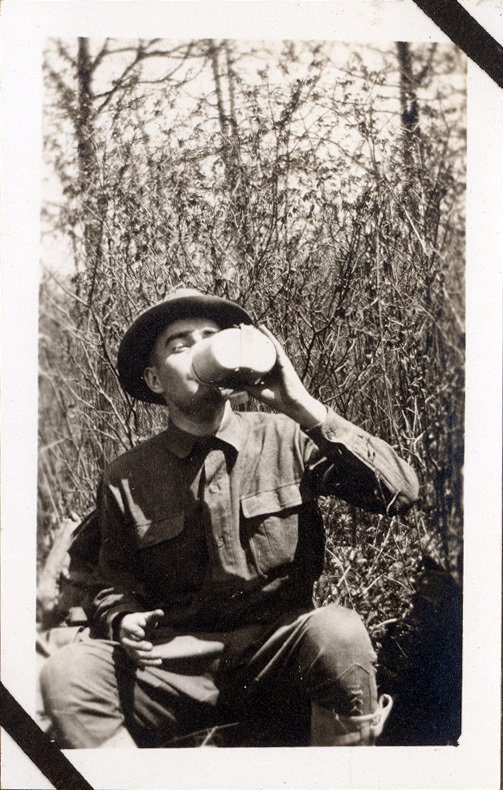 Lawrence took this photograph during a “hike” like the one he mentioned in this letter.